MSD for Mothers, a 10-year, US$500 million initiative to reduce maternal mortality, partnered with Gram Vaani and the White Ribbon Alliance for Safe Motherhood to deliver its model in Jharkhand, a state with one of the highest maternal mortality rates in India. We built a crowdsourcing strategy that can engage and empower women to become advocates for quality care and shape the delivery of maternal health services in India. Women calling the line would be asked to rate the quality of maternal care they received based upon a pre-programmed Interactive Voice Response scorecard. The same phone line would also provide information to women about what constitutes quality care. 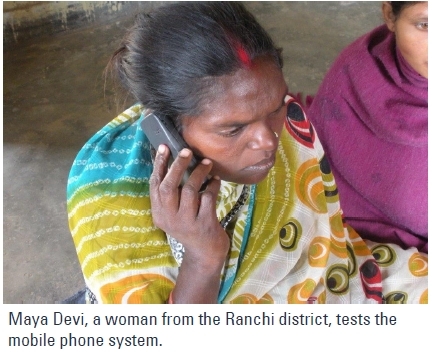 Participants’ feedback and stories would then be published on the phone system for others to access, so that women who call seeking information can listen to comments and determine which health facility they want to access. The participants’ feedback would also be synthesized so that health officials and health providers can use it to improve care — creating a full feedback loop. WRAI envisions building a rich database of information while empowering women to influence the standard of care for maternal health. With the simple and already common tools of a mobile phone and a cellular subscription – this could become a grassroots movement for millions.